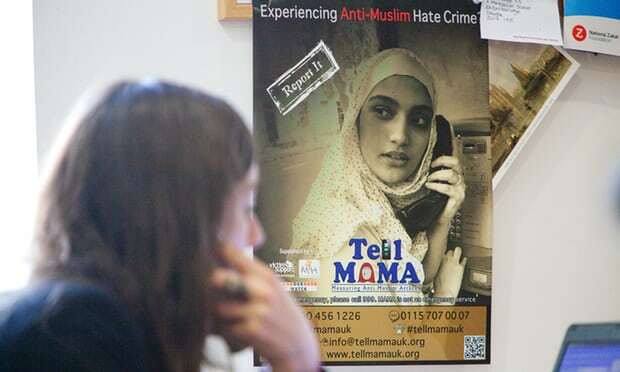 A record number of anti-Muslim attacks were reported in UK last year, mostly in person, face to face - and women are being disproportionately targeted, monitoring group Tell Mama has said. Those self-styled 'Brave Patriots', eh ? There were 1,201 verified attacks in 2017, a rise of 26% on the year before - and the highest number since it began recording. It's not like we haven't reported this before. And it's not like we didn't see it coming, either. Previous reports have been dismissed as 'temporary spikes', 'misinformation' or even 'fabrications'. This cannot. Criticism was also partly at the police, with a recent report from HM's Inspectorate of Constabulary finding large-scale failings in the way hate crimes were dealt with. Tell Mama said victims were often let down by poor recording of incidents and were sometimes left feeling dismissed. The world feels a more unstable space and in all of this, the voices of victims and outcomes for them in terms of access to justice have not been great. It is shocking to learn of a 26% increase in reporting of Islamophobic hate crimes. While no doubt some of the increase is due to an increase in reporting of incidents, most people especially Muslim women are reluctant to report Islamophobia. These findings reflect the fact that since 2016, a growing minority of people with far-right sympathies have felt emboldened by Brexit and the 2016 US elections. There has been a marked shift towards more serious offline incidents such as physical attacks, threatening behaviour and abuse more generally. Brave Patriots - Of the victims six out of 10 were women and of the perpetrators eight out of 10 were men, with the majority aged between 13 and 18. It’s angry men attacking women. The perpetrators are a part of a generation of angry, disillusioned young men who vent their fury against women per se. Correct me if I am wrong. All Muslim scum must be gassed. We are at war! The UK Armed Forces must go to the Islamic areas and go door to door and shoot them all. Imran Awan, an associate professor of criminology at Birmingham City University, said police were not always sure what to call hate crimes and inconsistency did not help. We need to look at the grassroots or the problems, such as the social deprivation in society. A lot of it can be dealt with through education especially at a younger age. That element seems to be missed.